At the California Jam, April 6th 1974. Photograph by Robert Ellis. The Guess Who Makes It 175! Ritchie Blackmore as a kid, lived next door to a guitarist who taught him to play. He thought that everybody must be that good, without realizing that his neighbor was none other than THE, “Big Jim Sullivan”. Ritchie Blackmore was the only musician to get Jim Marshall to customize 200 watt Marshall Major amps, with extra output tubes, to become 300 watts. Also, he had a dummy stack of speaker cabinets loaded with pyrotechnics. He used to play a Gibson ES-335 until he heard Jimmy Hendrix on a Fender Stratocaster. That sound, he said: “Hit me, ‘Straight Between the Eyes;” which was the title of a Blackmore’s Rainbow album. Blackmore, in response to criticism of his physical abuse of his instrument, once said: “When you can play guitar as well as I can, you have the right to kick it around a bit.” I had the privilege of seeing Deep Purple live on the Machine Head tour, and Blackmore’s Rainbow on several occasions back in the ’80s. 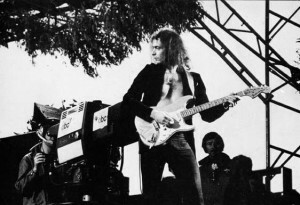 During one of Rainbow’s shows, Ritchie removed his natural finished Strat and his tech placed it gingerly, well off to the side of the stage, horizontally on the top of a 4X12 bottom Marshall cab. At one point during the next number, Blackmore tossed his white Stratocaster about twenty feet up in the air. It landed smack dab on top of the natural finished one, as Blackmore stiffly jumped in horror. He must not want to kick around his favorite guitars. The last Rainbow concert I attended, towards the end of the performance, Ritchie Blackmore did an improvised intro which started to become Child in Time. The audience failed to respond accordingly, so he quit playing, then changed his tune. Too young a crowd by then to recognize his tour de force. I’m still amazed at the writing at the age of sixteen. I’d go as far as to say that it’s better than most seasoned journalists in present day. Priceless – thanks! Cameron used to be so cute when he was little. Oops, wrong reel. Here it is. How old were you when you wrote this? Roger Ebert called it a “scuz-pit of a movie”. That’s pretty ironic, hilarious actually, considering that Roger Ebert wrote the script for Beyond the Valley of the Dolls. Don’t feel bad. Ebert also panned Clint Eastwood’s final Western, the Oscar winning, “Unforgiven”. Can you believe how cheap Clint Eastwood is? He knew that Unforgiven was a master piece, and planned for it to be his cowboy swan song, yet he Semiticed the writer down to a measly fifteen grand for the option. Can you believe how cheap Clint Eastwood is? He knew that Unforgiven was a master piece, and planned for it to be his cowboy swan song, yet he Jewed the writer down to a measly fifteen grand for the option. Gott’a hand it to Clint, though. Bird was the first film to utilize digital technology to clean up old Charlie Parker 78 rpm recordings and make them clean, clear, and dynamic. After seeing that FLICK, I ran into an old guitar playing buddy of mine, who’s girlfriend dragged him off to see, “Crossing Delaney” instead of “Bird” which he had preferred to see. I was still in a daze after the celluloid experience. Hey Ron. Love your enthusiasm, but you are killing my inbox with comments. How about one comment per topic? Thanks man.